The sauna is one of Finland’s most important contributions to the rest of the world, having outlived Finland’s other exports — among them Nokia flip phones, Angry Birds, and Sibelius symphonies — in its enduring popularity. As one of the most northerly countries in the world, it’s no wonder that residents of this frosty place enjoy sweating in hot boxes as often as possible. Outsiders who don’t understand saunas’ appeal are usually doing them all wrong. Finnish saunas often have windows looking out onto lovely views and involve cooling off in a lake or shower in between rounds. Sauna events can take hours, involving lots of cold beers or just quiet relaxation. A lot like mindfulness, the goal isn’t to sweat as fast as possible and get out — rather savor the moment. Saunas are such an important part of Finnish life that Finns can’t think of any place not to put a sauna — be it suspended in air, rolling along a street, or floating on a lake. The penchant for crazy sauna locations has even spread beyond Finland. Here are some of the craziest saunas found around the world. 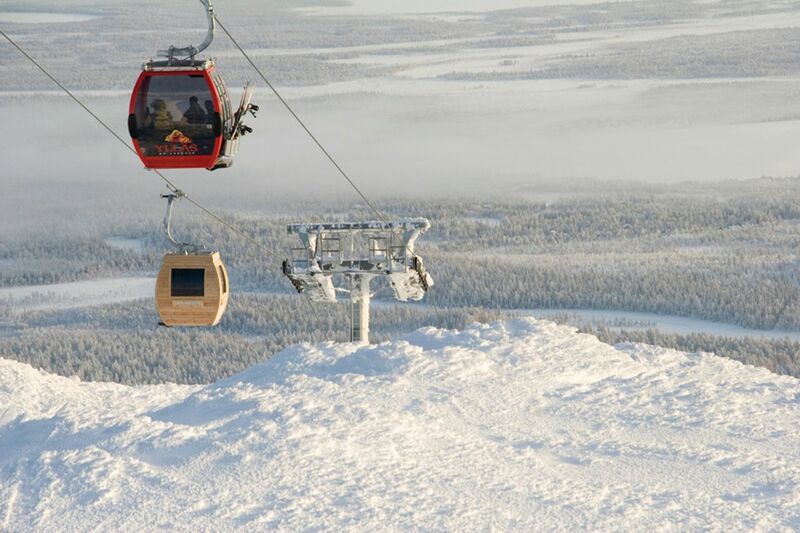 One hundred miles north of the arctic circle, at Finland’s Ÿllas ski resort, the idea of a beautiful view is taken to the next level. 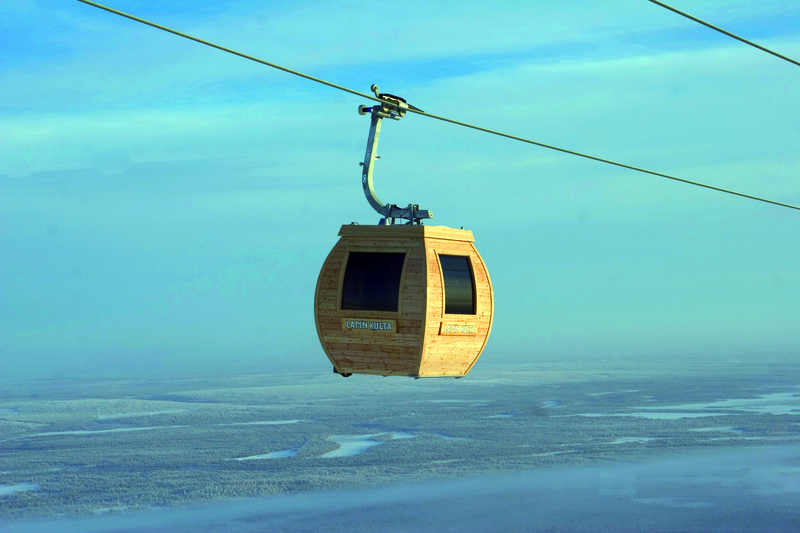 You can strip off your clothes, get into the sauna gondola, and head upwards. Take in the snow-covered hills as you toss water onto the sauna rocks and experience löyly, which is the rush of soothing heat after you’ve first wet the rocks. You’ll be in the gondola about 20 minutes, which is plenty of time to get good and sweaty as you are carried in the air above the skiers below. But it’s all part of an overall two-hour experience that includes hot-tubbing at the base of the ski hill and more sauna time on solid ground. You can have up to 12 guests for the whole two hours, alternating which four people go in the sauna at a time. The whole thing costs €1350, which — compared to the per person price of a fancy private sauna in Helsinki — is a bargain in the sky. Besides saunas, Finland’s other favorite pastime is going to hockey matches. Why not do both at the same time? At Helsinki’s Hartwall Arena, you can rent one of a couple of skyboxes with saunas that overlook the action below. The largest one is the Skybox 408. While the entire skybox fits up to 72 people, you can’t pack quite that many into the sauna at one time. But you can certainly fit a healthy number of sweaty fans, who are no doubt getting extra heated watching their team duke it out on the ice. You can find floating saunas on a lot of Finland’s lakes and even in the Baltic Sea off downtown Helsinki. Floating saunas offer sauna-goers the added convenience of not needing to walk naked and barefoot across slippery rocks to get down to a lake or river to cool off. Since the sauna is already on the lake, all you need to do is walk out the door and jump off the dock. 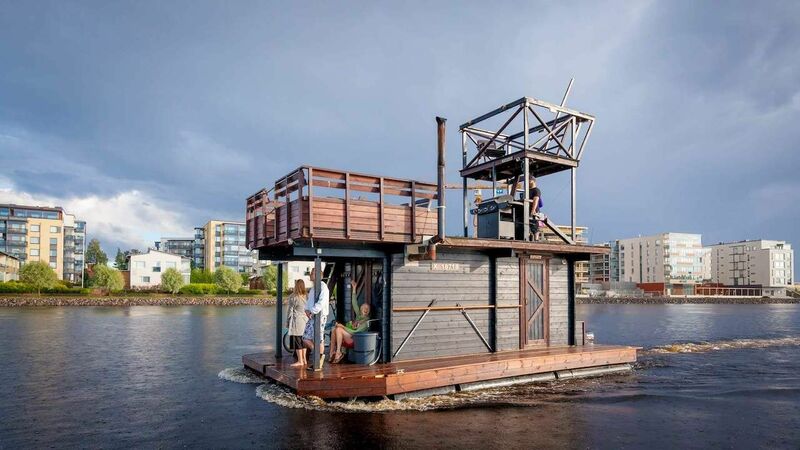 We’re particularly fond of this sauna raft, or Saunalautta, which was built by hand by a group of friends. In addition to a bunk room to chill out in, it’s got an observation deck on top that doubles as a very tall diving structure. If the water is deep, you can take your cooling post-sauna dip right from the upper level. As Nick Klein puts it, he and his fellow Left Coast Sauna founders had seen the mobile saunas of northern Europe and wanted to bring the idea to their Bay Area home. So, they created a six-person sauna in a cedar barrel and put it on wheels. They originally thought it would just be “rentable for special events but otherwise tucked away,” says Nick. 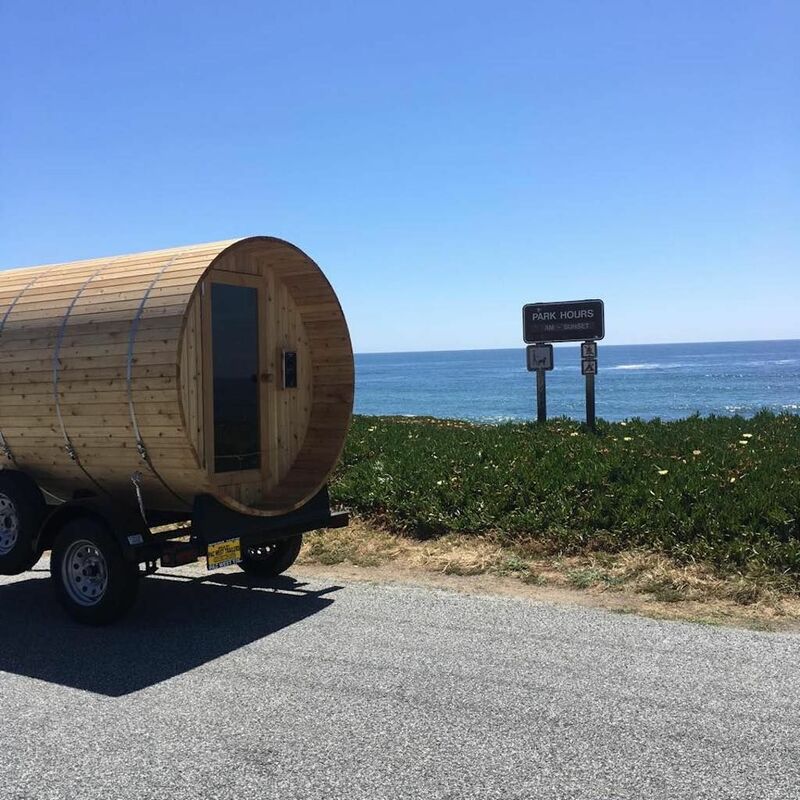 Seeing interest piqued by their movable sauna, though, the team was motivated to roll it out in rotating locations in and near San Francisco. It has pulled up everywhere from grassy fields in Marin County to San Francisco’s Noe Valley neighborhood, parking on the street next to the local community space. Using the sauna is free for the first session, but they ask for donations if you want a second or third go-round. Left Coast Sauna is now contemplating a sauna parking spot in SF’s Mission District. 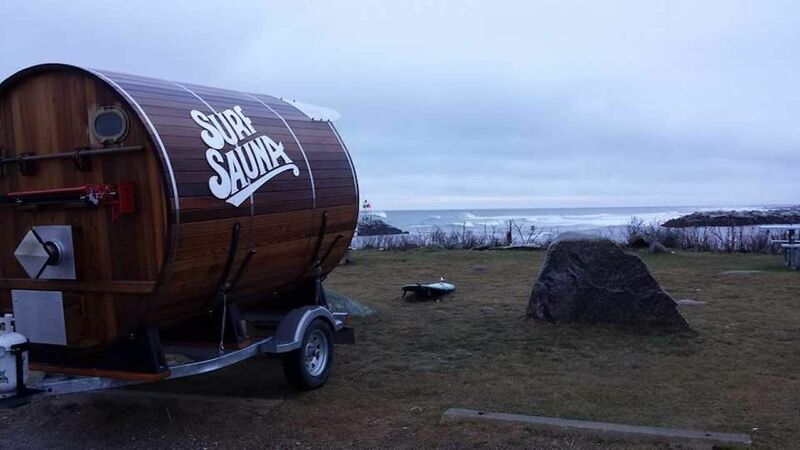 Diehard surfers in the US’s northeast have taken the Left Coast Sauna idea to a new extreme. They saw a problem and found a solution: how to surf when the waves are good but the air temperature is below freezing and the ground is covered in snow? Wetsuits can only be so thick before you start looking like the Michelin man and can’t even paddle. Take a cue from the Finns and warm up between outdoor sessions in the Surf Sauna, the joint project of New Hampshire surfers, craftsmen, and seasoned seamen. Made of red cedar, the Surf Sauna comes in the same barrel shape and can be pulled right up to the shore on the snowiest surf day — the idea itself no longer an oxymoron. 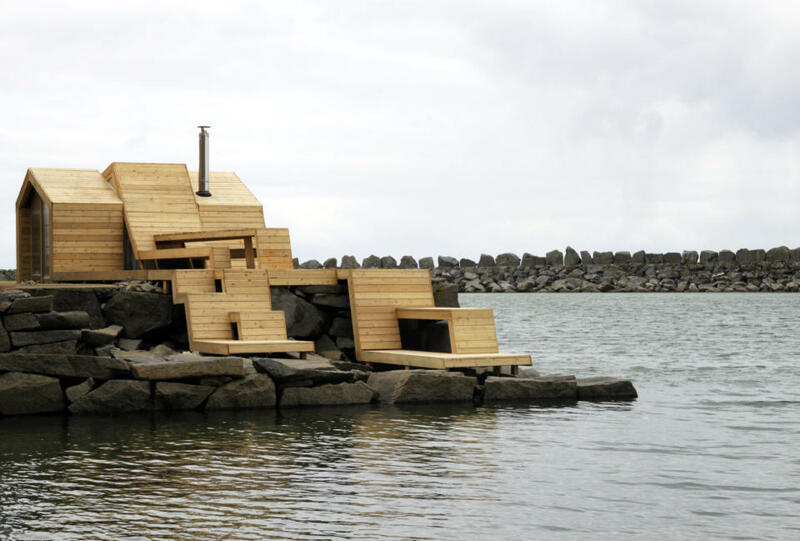 This crazy sauna structure that stretches out like unfolded origami paper over rocks by the seashore on one of Norway’s Lofoten Islands was designed by students of the Oslo School of Architecture and Design. The sauna complex was built in a former fishing village near an abandoned fisherman’s house and buildings once used for salting cod and producing cod-liver oil. The hope is to turn the area into an art and culture center with the Bands Sauna as a centerpiece. The sauna structure has a spacious 160-square-foot sauna, a sunken hot tub, and a picnic area, plus access to icy waters for a refreshing dip between perspiration sessions. The wooded hills seem to go on forever in this hilly, forested Alsace region of France, not far from the Rhine River and the German border. The Hostellerie La Cheneaudière & Spa wanted its guests to savor the view while relaxing in the sauna, so it built a sauna on the second level of the hotel with nothing underneath but the columns to support it. After downhill or cross-country skiing in winter, or hiking and mountain biking in summer, hotel guests can relax by the pool and walk up the stairs to the elevated sauna and admire the natural vistas. If guests have done no exercise at all, the sauna has the added benefit of helping them sweat out the alcohol from all the fabulous French wine they’ve been drinking. In Germany’s erstwhile coal-producing region, in the middle of what the architecture firm modulorbeat calls “an industrial wasteland,” this 24-foot-high sauna is built out of stacked, four-sided, prefabricated concrete frames. The frames were once used for coal-mining pits. Here, instead of going down a mineshaft, you climb up. The ground floor holds a plunge pool, the middle level holds the sauna, and the top floor holds a relaxation room with a view of the sky. The name of this architectural oddity is “One Man Sauna” because the sauna room is big enough for only one person, and the area above has just one bed to lay on and observe the sky. The idea is to create a space for calm and relaxation but also to contemplate a place, like an industrial ghost town, where there is no longer anything to do.